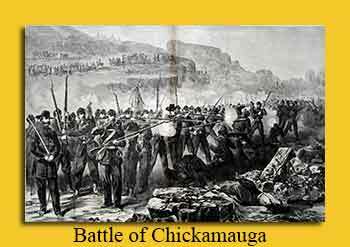 On this day in 1863, the two-day battle of Chickamauga began, ending in one of the last great field victories for the Confederacy. The first day’s action, fought in densely wooded terrain, became a classic “soldier’s battle” in which generalship counted for little and the outcome was decided by fierce small-unit encounters.Texas units in the Georgia battle included Hood’s Texas Brigade, Ector’s Brigade, Deshler’s Brigade, and Terry’s Texas Rangers. As Hood’s Brigade went into battle they called to a regiment of exhausted Tennesseans, “Rise up, Tennesseans, and see the Texans go in!” When they in turn came staggering back from the woods after being repulsed by Union cavalry, a Tennessean was waiting to yell, “Rise up, Tennesseans, and see the Texans come out!” Among the Texas casualties in the battle were Gen. James Deshler, who was killed, and John Bell Hood, who lost a leg. Order your signed / personalized copy of Texas As I See It from our website for shipping anywhere in the world.